With all the beautiful sunshine we’ve had this week in Atlanta, what a great way to enjoy your weekend with cupcakes and cocktails! 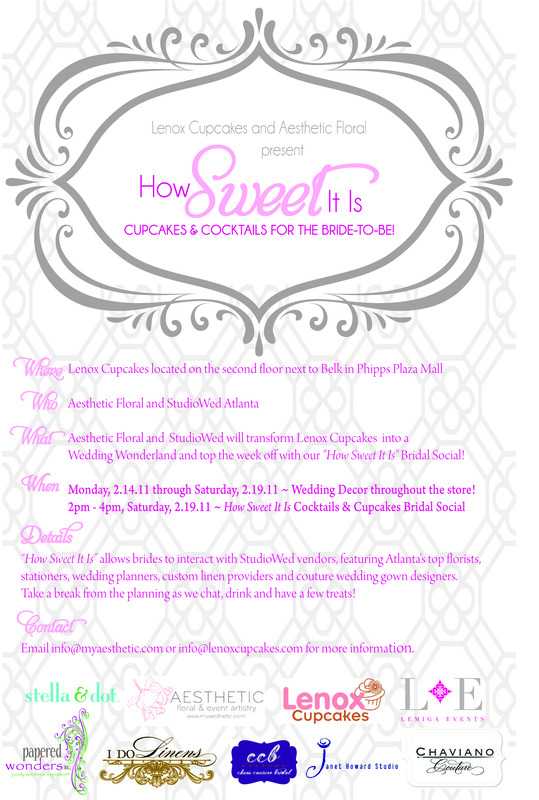 “How Sweet It Is” Bridal Soiree is tomorrow at Lenox Cupcakes located in Phipps Plaza. Brides-to-be can come out and meet StudioWed, an exclusive collection of Atlanta’s wedding vendors representing the finest wedding professionals that service the Atlanta area. We have transformed the window display into a wedding wonderland! Participating vendors include: Lenox Cupcakes, Aesthetics Floral and Event Artistry, Lemiga Events, I Do Linens, Stella and Dot, Chaos Couture Bridal, Janet Howard Studios, Chaviano Couture and Papered Wonders, Inc.
What a great blog post. I appreciate your thoughtful and interesting feedback. I am often surprised that more people do not discuss this topic more often.